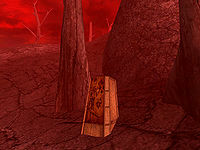 Ghostgate is the main gateway through the ancient Ghostfence artifact to the Red Mountain region, preventing monsters affected by the Blight from leaving. 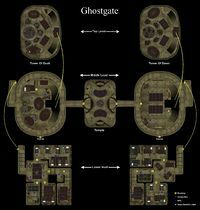 Ghostgate houses a large Tribunal Temple and contingents of both Buoyant Armigers and Ordinators. 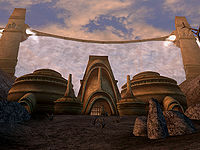 The two towers of Ghostgate, called Dusk (west) and Dawn (east), were constructed after The War of the First Council as one of the many defenses against the evils of Dagoth Ur. The Tower of Dusk houses Redoran volunteers, with services including a Smithy with a fairly comprehensive array of glass armor pieces (on the lower level). The publican Galore Salvi sells drinks and food and provides beds. The Trader Fonas Retheran provides services only to kinsmen of House Redoran. The Tower of Dawn is less factional and has a room for rent. Faras Thirano is an enchanter and has many various items for sale. The healer Ulmiso Maloren has potions and spells for sale. The Temple itself is directly over the tunnel leading through the Ghostfence. Nilvyn Drothan provides potions, spells, and spellmaking. There are an array of shrines with blessings available for the faithful. Mertis Falandas is the Master Trainer in Spear, behind a locked door on the Lower Level, Tower of Dusk. Uvoo Llaren is the quest giver here for the Tribunal Temple. Wulf is in the tavern in the Tower of Dusk, after a certain point in the Main Quest. 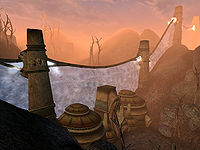 There is a route off the foyada leading up to the Ghostfence that will take you to Ald'ruhn, which rises up to the Ghostfence briefly, so you can peer through at the quaint, curious and homicidal inhabitants of the Red Mountain region, before dropping south and skirting the Daedric shrine of Ramimilk as it turns west again. Alternatively, one can simply backtrack down the Foyada Mamaea until you reach the turnoff to Moonmoth Legion Fort and Balmora. There are many pieces of glass armor and weapons inside, both on people and in crates. If you have a reasonable Mercantile skill, the Blacksmith Dronos Llervu has some slightly damaged Glass Armor at steep discounts. Consider paying Wulf a visit for a new power, if you have acquired Wraithguard. The Citadels of Red Mountain are almost all located inside the Ghostfence, however the way in is heavily guarded by leveled Ash Creatures. The Shrine of Pride is just northeast of the gate, contrary to in-game dialogue that claims it is to the west. Pass through the gate going north and turn right at the first opportunity to get there. A camp of outcast Ashlanders called Ahinanapal can be found near the Ghostgate. Auriel's Bow: Find the bow that smells like ash yams somewhere in Ghostgate.